Industrial Thermocouple – choosing the right one. The answer to the question “what kind of thermocouple?” depends on several factors relating to the process to be monitored, such as its compatibility with the media/process environment, frequency and accuracy of measurements required, and the regulatory environment in your industry. Temperature measurement is a key parameter in manufacturing and processing operations in many industries, from refining to pharmaceuticals. Accurately monitoring the temperature helps ensure safe, efficient and optimal outcomes. The two most common industrial temperature measurement technologies today are resistance temperature detectors (RTDs) and thermocouples. Each has its advantages and disadvantages. Thermocouples offer relatively low cost, ruggedness, fast response time, and the ability to measure media up to 2,300°C (RTDs are suitable for use for up to only 850°C). However, thermocouples are less accurate than RTDs (their accuracy degrades over time), and their output is nonlinear. RTDs offer greater accuracy, repeatability, and stability, but they have slower response times and are more expensive than thermocouples. A thermocouple is almost always the measuring instrument of choice for applications above 800–900°C, but selecting the ideal industrial thermocouple also requires knowing some things about the process where the instrument will be used. First, consider whether the thermocouple will be in direct contact with the process or if it will be integrated into a thermowell assembly. 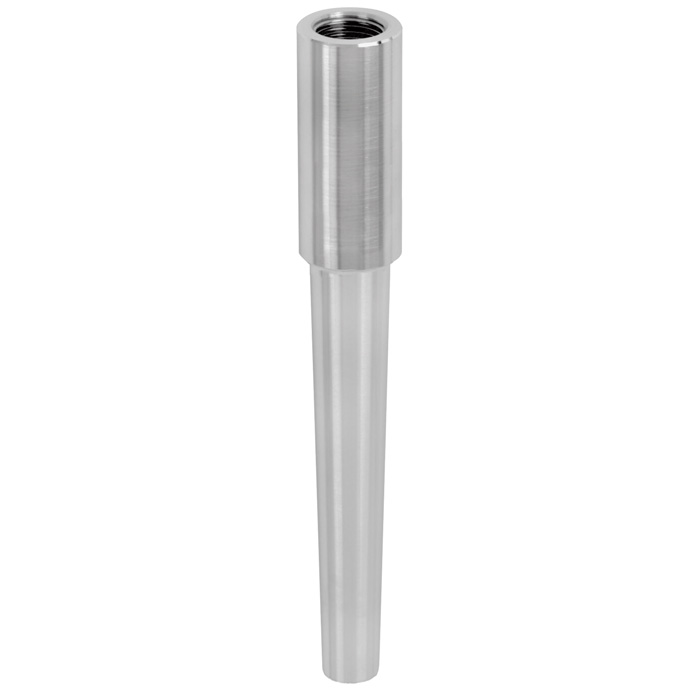 Thermowells protect the thermocouple from corrosive, fast-flowing, or extremely hot process media. 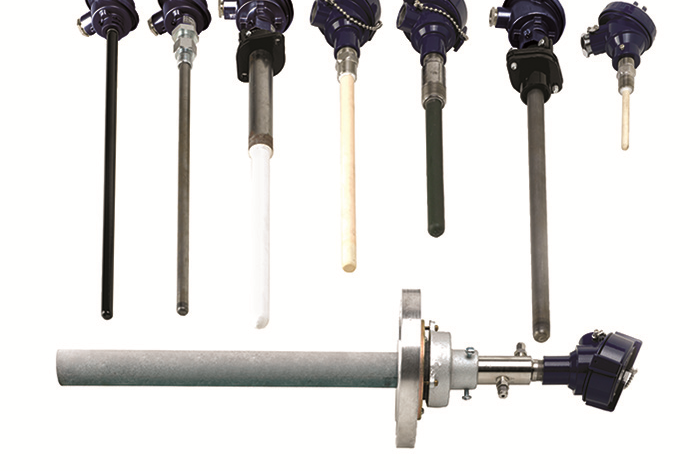 Approximately 75% to 80% of industrial thermocouples installed in the oil and gas, refining, petrochemical, power generation, and pulp and paper industries today use thermowell assemblies. The second decision is the material. A large majority of industrial thermocouple are made of stainless steel, but certain applications call for specialized alloys like Inconel 600, Hastelloy X, Monel, or the like. Note that thermocouples for high-temperature applications use specialized ceramic thermowells to insulate the metal wires in the instrument assembly. Next, determine whether you need a traditional industrial thermocouple assembly or a flexible thermocouple sensor for use in a tight or difficult-to-reach location. Finally, you must decide on the type of industrial thermocouple needed. Type, in this context, refers to the metal wires in the instrument used to actually measure temperature changes. Different metals have varying temperature ranges and other properties that make them suitable – or unsuitable – for use in specific applications. WIKA offers eight types of thermocouples. The primary criteria for deciding which one to use depend on the properties of the media the instrument will be in contact with, as well as the temperature of the application. Type K NiCr-NiAl thermocouples — typically used in oxidizing or inert gas atmospheres up to 1,200°C, 2,200°F (ASTM E230: 1,260°C,2300°F ). Type J Fe-CuNi thermocouples — typically used in vacuum applications, oxidizing and reducing atmospheres, or inert gas atmospheres for temperature measurements up to 750°C, 1,380°F (ASTM E230: 760°C, 1,400°F). Type N NiCrSi-NiSi thermocouples — typically used in oxidizing atmospheres, inert gas atmospheres, or dry reduction atmospheres up to 1,200°C, 2,200°F (ASTM E230: 1260°C, 2,300°F ). Type N thermocouples are very accurate at high temperatures; they are often used instead of Type K thermocouples in applications where a longer service life and greater stability are required. Type E NiCr-CuNi thermocouples — typically used in oxidizing or inert gas atmospheres up to 900°C,1,650°F (ASTM E230: 870°C , 1,600°F). Type T Cu-CuNi thermocouples — typically used at temperatures below 0°C, 32°F with an upper temperature limit of 350°C,660°F (ASTM E230: 370 °C, 700°F) in oxidizing, reducing, or inert gas atmospheres. These thermocouples are highly resistant to corrosion, even in moist atmospheres. Types R, S, and B are noble-metal thermocouples that are typically used for higher-temperature applications. Types R and S are also used in some specialized applications because of their high accuracy and stability. To find the right industrial thermocouple for your application, take a look at WIKA’s Quick Ship Guide for Electrical Measurement. Whether you use the preselected product codes for popular products or opt for the Quick Order Code Builder included in the guide, it is simple to order the exact thermocouple you need for your specific process.